State governments are faced with the immense task of rolling out energy projects that will dramatically increase the renewable power component of their energy mix in a short space of time. Energy companies that are developing solar projects of seizable proportions are in a race against the clock to replace ever greater portions of the regular energy supply by power sourced from renewables. In the case of solar power, a major requisite is roof space. This is where projects involving residents, energy companies and governments come to fruition. Take the case of Duke Energy in North Carolina. The company recently announced plans to rent roof space of home owners in this state. The company will install photovoltaic solar panels on 425 homes in a $50 million project. The company will generate enough energy to power 1,300 houses. The project won’t deliver miracles overnight and has caused a major consumer upset. Yet it’s likely that it’s a blueprint of what’s going to evolve in the future in other places. Solar energy panels on roofs of ordinary residences builds on from the success of similar deals between energy companies and various large companies. The first big such contract was signed in 2006 when General Motors installed solar panels on top of its largest European production facility in Spain. More recently, ProLogis, a large distributor in California, signed a deal to have panels installed by Edison in South California. 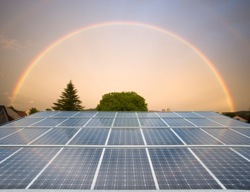 Edison has plans to become the US´ largest solar energy provider. It rents 607,000 square feet of ProLogis’ roof space in the Californian town of Fontana. Output will be produce 2.2 megawatts, enough for up to 1,426 households. Edison has plans to generate 250 MW of solar energy in around five years’ time. The residential sector is increasingly going to be part and parcel of this plan. The logistics are mostly what makes this interesting. Authorities and companies are increasingly working together to establish solar solutions at a rapid pace. Energy companies, once they’ve got official approval, will be able to extend their ‘solar parks’ quickly and with relatively little hassle. They’ll fix normal residents up with solar panels which they’ll own and maintain. Home owners will get a fee for renting out their roofs and don’t even need to purchase the energy. The main selling point of the panels is that they’re going to be professionally managed. That’s a great way of reducing your carbon footprint. Other projects involve consumers in different ways. Individuals that generate energy in the state of Wisconsin are encouraged to sell it back to the grid. The state’s officials are investigating ways of stepping up the generation of home grown solar power as part of a plan to set up a massive solar power project within the next 12 months. The state has commissioned a feasibility study into large-scale solar power and buzzwords include community power generation. At the moment people living in Wisconsin can transmit energy to Second Nature and get paid a standard amount for it. The total amount of solar energy is targeted to increase 680 kilowatts, according to a newspaper report. Investments to the tune of $5.5 million are made. The plans have strong backing of the Sierra Club, which lobbied intensely for the idea of setting up a state-wide solar plan. Aside from the established energy companies and state governments, newly established independent companies are also beginning to make inroads in the solar market. Some have enticing offers. A Delaware headquartered company called Citizenre has a very interesting formula; it installs, owns and operates the solar systems on a private individual’s residence. The home owner then pays a rental fee for the solar electricity which often is around 20% lower than the normal energy bills. Citizenre is active in all states which have a net metering law. It offers contracts for one, five or 25 years. Excess power generated is sold back to the local utility by the Citizenre, which is why the company can offer its cost reductions. The advantage of these types of schemes is that energy prices might go through the roof, but that this won’t affect the solar panel renters. The cost/benefit analysis of the Duke scheme in North Carolina meanwhile is a lot less compelling. The total amount of energy Duke will be generating after having invested $50 million won’t be all that astounding, an Ecogeek reporter points out. Less than one-tenth of one percent of Duke’s customer base in North Carolina will benefit from the solar energy generated. And many people are balking at the extra costs involved for Duke’s entire customer base. The company is charging each household 8 cents for the investment, whether they are consumers of green energy or not. Duke had to downsize its plans due to the protest of the North Carolina Utilities Commission, a consumer advocacy organization. Meanwhile, North Carolina’s official target for renewable energy is 12.5% by 2021 and alternatives are few and far between as yet.